Last fall’s harvest was pretty good for most parts of Minnesota. The rains stopped in the summer and a bit more rain at the right time would have helped, but all in all the harvest was good. The level of corn in the wagon is a metaphor for the quality of the harvest. It was a good harvest but not overflowing. I came across this shot in some really nice light one evening after work. I’ve got some more photos from the same night that I’ll share in the future. 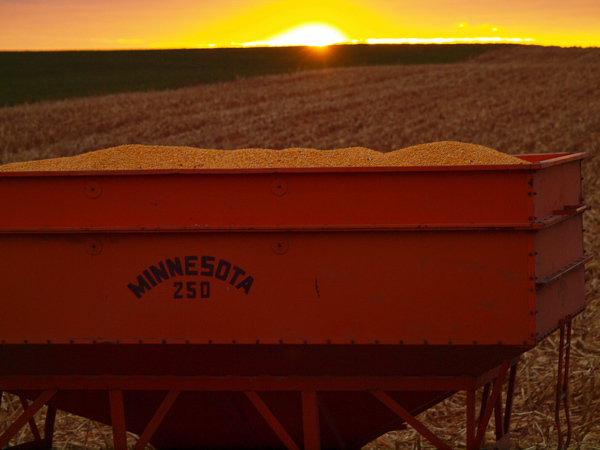 This entry was posted in Uncategorized and tagged autumn, copyright ryan ware, corn, corn field, harvest, sunset. Bookmark the permalink. Ryan, this sunset scene is spectacular. Especially like, too, the “Minnesota” on the wagon. The colors meld beautifully. If you have not entered this image in a contest, you need to find one and enter it.